In the early 1920s, Imperial Japan noted that their tank arm was in need of updating. Japan had not had much experience with tanks prior to this. In 1918, Japan received a number of the British made Medium Mark A ‘Whippet’ tanks, followed by the acquisition of 13 Renault FTs, Japan’s first Modern tank*. The Whippets did not see much action, though the FTs did serve in Manchuria from 1925 with some combating Soviet forces in 1932. *The Renault FT is often considered to be the first modern tank, as since its appearance, tanks have more or less followed its general layout. This being a fully rotating turret, and separate crew and engine compartments. 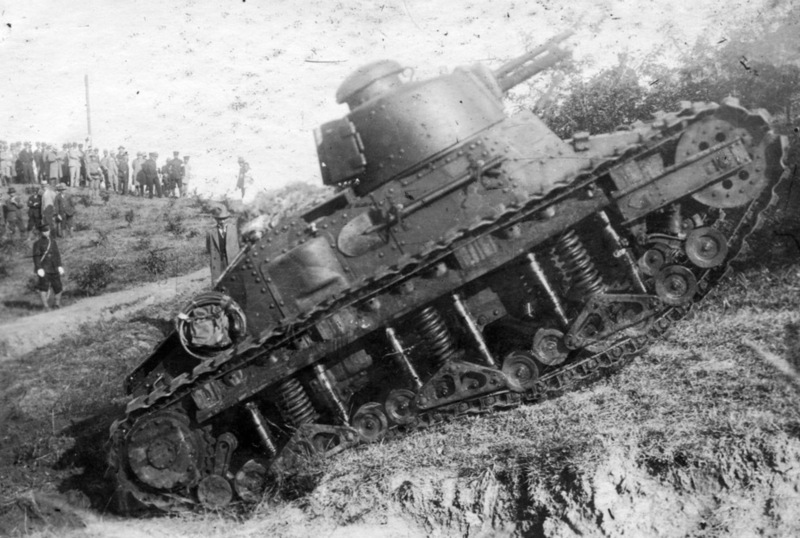 The Japanese liked the French tank, and, as soon as an upgraded version was available, they purchased more in the late 1920s. This upgraded tank was the Renault NC 27. 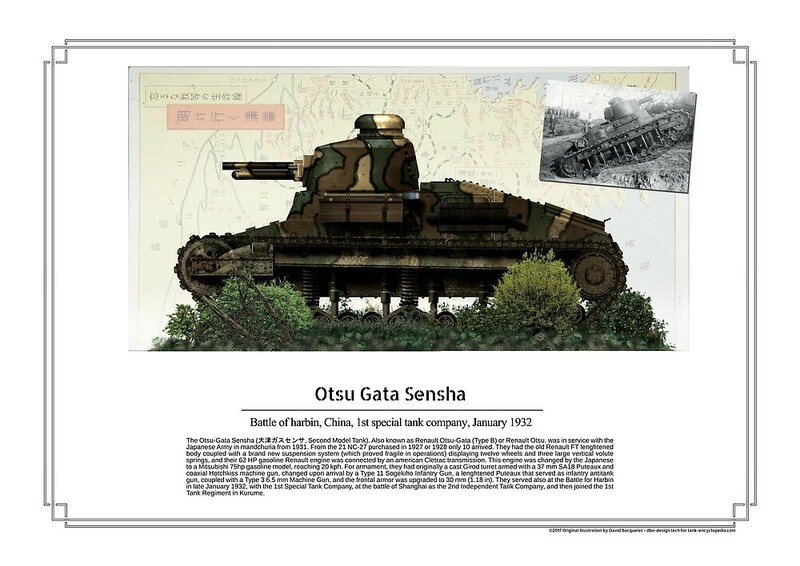 In Japan it would go by the name Otsu-Gata Sensha (大津ガスセンサ, Second Model Tank). It is also known as Renault Otsu-Gata (Type B) or simply Renault Otsu. The NC-27 was an upgrade to the famous First World War era Renault FT. It’s biggest upgrade was the running gear, which was completely revised. This featured twelve wheels and three large vertical volute springs, mounted on the lengthened body derived from the FT. The tank was powered by a Renault 62 hp 4-cylinder in line, gasoline, water cooled engine. It was coupled with a controlled differential based on the ‘Cletrac’ system. This was named after Cleveland Tractor Company who designed it. Speed was 10.5-11.5 mph (17-18.5 km/h). The main armament of the NC consisted of either the Puteaux 37mm (1.46 in) low velocity gun or a 7.5 mm (0.295 in.) Hotchkiss machine-gun. The NC was operated by a crew of 2; Commander and Driver. The Driver was located in the forward hull, just in front of the turret where the Commander was located. The Commander was also in charge of the main armament acting as loader and gunner. The tanks were first purchased by Sweden, Poland and Yugoslavia. Sweden noted that the suspension did not suit harsh terrain, and that the clutch/brake system was extremely fragile, and prone to faults. This was known to the Japanese, but this did not stop them from buying 10 NC-27s as they had yet to develop any light tanks of their own. Twenty-three were ordered, but for unknown reasons, only the first 10 ever arrived. 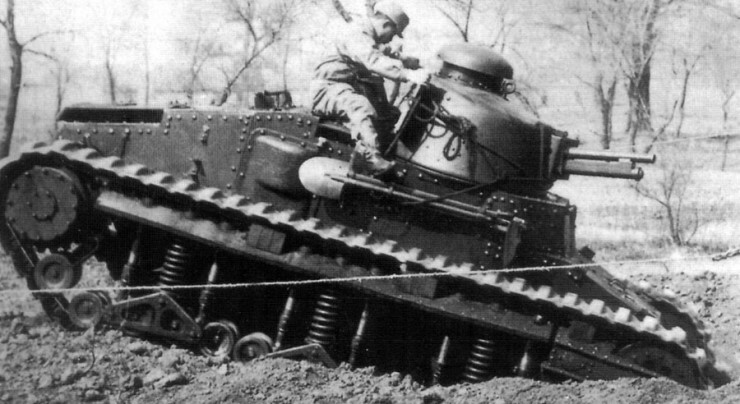 The Japanese made a few modifications to the tank. The 62hp Renault gasoline engine was replaced with a 75hp MItsubishi. This marginally boosted the tank’s top speed to 12.4 mph (20 km/h). The main armament was also replaced with the 37mm Type 11 Sogekiho Infantry Gun, itself a development of the original Puteaux gun, usually equipped to infantry units as an anti-tank gun. The Type 11 had a much longer barrel, granting higher velocity and penetrating power. Some Otsus were also armed with the Type 3 6.5 mm Machine Gun. The armor also saw an upgrade, with the frontal glacis being increased to 30mm (1.18 in.) thick. The Otsu-Gata being demonstrated infront of Japanese officials. Photo: SOURCE. Armament 37mm (1.46 in) Type 11 Sogekiho Infantry Gun or Type 3 6.5 mm Machine Gun. The Otsu-Gata Sensha. Illustration by Tank Encyclopedia’s own David Bocquelet. Along with Yugoslavia, Japan was one of the only countries to ever use the Renault NC-27 in combat. This tank, as well as the FT, also gave Japan their first experience with Light Tanks, as up until this point the only tank in the Imperial Japanese Army’s (IJA) inventory was the Type 89 I-Go Medium Tank. Its first action came on the 18th of September 1931, with the beginning of the Japanese intervention in Manchuria. 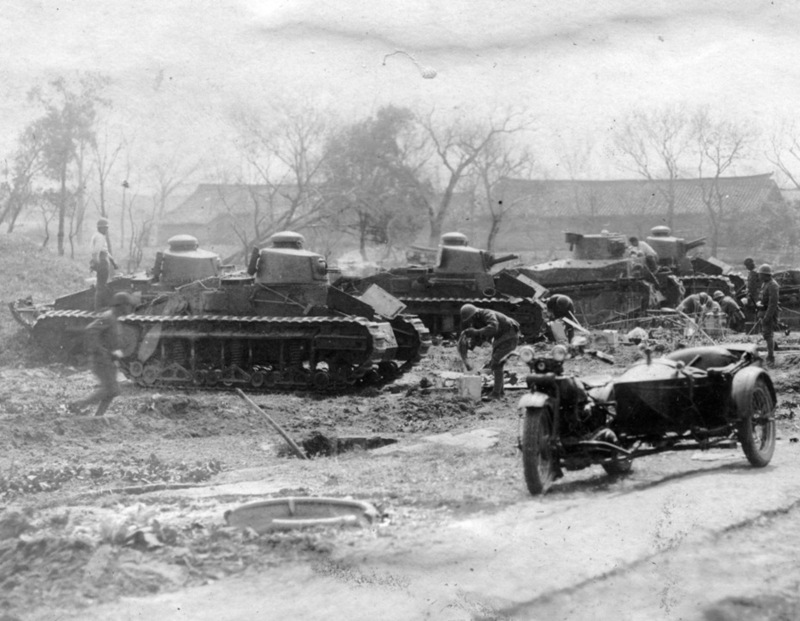 Next came the Battle for Harbin in late January 1932, in which it served alongside the Type 89 I-Go. The Otsu-Gatas served with the Type 89s in the 1st Special Tank Company, commanded by Captain Hyakutake, in support of the 2nd Infantry Division. The battle was an easy win for the IJA, which outmatched the poorly trained Chinese forces. Around the same time, fighting broke out in Shanghai. Here, the Otsu-Gata served in the 2nd Independent Tank Company, commanded by Captain Shigemi. This unit was also equipped with Type 89 mediums. The tanks became unsuitable in this particular theatre of war. The complicated suspension was not suited to the harsh East-Asian terrain, as such the suspension and clutch issues previously identified reared their heads once more. It was also found that they had a rather limited operational range, running out of fuel and supplies extremely quickly. Japan’s own Type 89 Medium soon proved to be far superior. 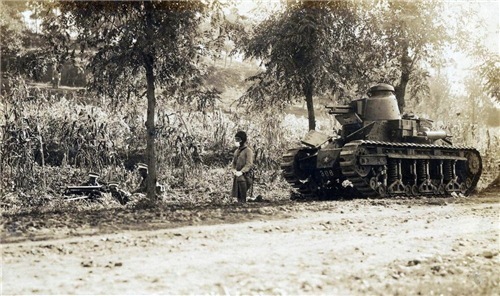 Remaining Otsu-Gatas were relegated to training vehicles as part of the 1st Tank Regiment in Kurume. There would be joined by the Type 89 as better tanks replaced both vehicles. 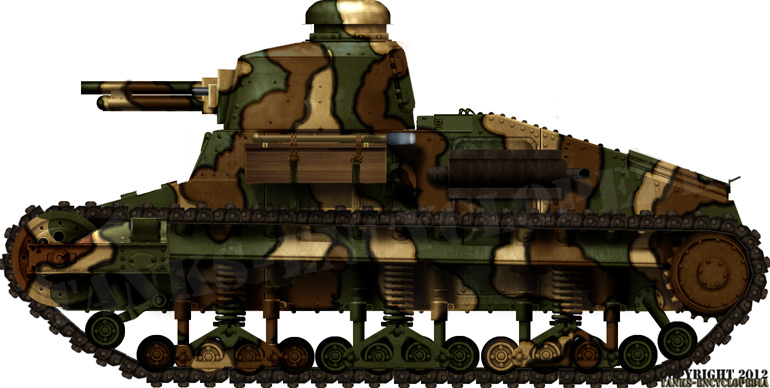 Though not a complete success in combat, the Renault Otsu – as stated above – provided the IJA with their first experience with Light Tanks. 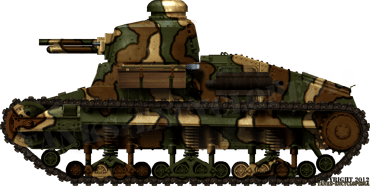 This paved the way for Japan’s own light tank development which would culminate in tanks such as the Type 94 Te-Ke and Type 95 Ha-Go, the latter of which became Japan’s most produced light tank of World War Two era, and spawned countless variants. Unfortunately, no Japanese operated Renault NC-27s survive today, but Sweden’s is on display at the Arsenalen Tank Museum, Sweden. Get the Poster of the Otsu-Gata Sensha and support us !